Enjoying a cup of coffee in my new mug while catching up on things! We arrived home about 1am to a house full of excited kids (except Ellie who decided she could wait to see me in the morning!). It was great to be greeted by hugs, kisses and doggie licks from Cici! I know that it’s going to take me a long time to adjust to being home. 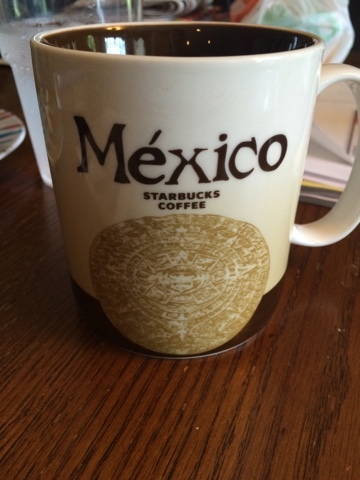 My focus for the next few days is to unpack, spend time with my kids and reflect on my experience in Mexico. I do have more blog posts to write as I gather my thoughts and plan for a new year of teaching. I am very appreciative of everyone who read my posts each day! I hope that it inspired you to travel, to learn and to get out of your comfort zone. I was not sure how I would react to this trip. Now that I am home, I am certain that it was the right place and right time for me to go. It was hard to leave my family, but I learned a lot about myself in the process. It was a blessing to have this trip paid for by both the Ohio Foreign Language Association and the Mason Schools Foundation. I am forever indebted to them for making this possible for me. Hasta luego!